Mary, Mother of the Church is an active, prayerful, celebrating, Catholic community in La Crosse, Wisconsin. We invite you to visit our parish family. You are welcome here! Our Masses are at 4:00 Saturday, 8:00 and 10:00 Sunday. 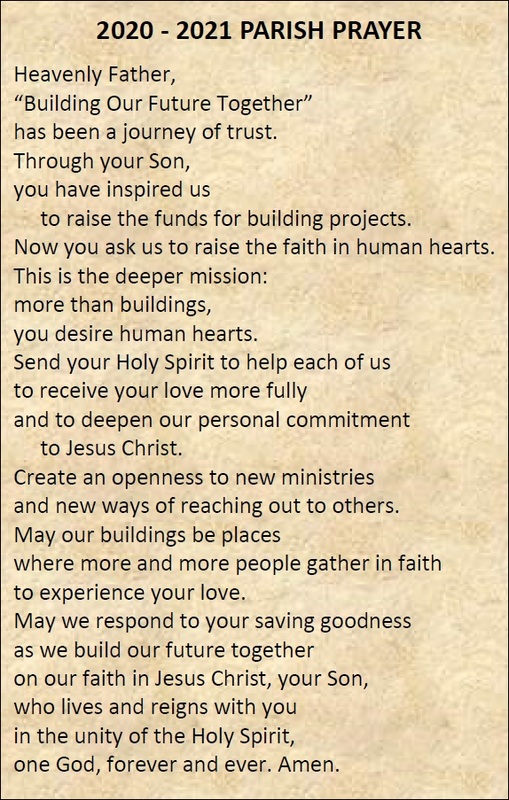 Come share in our parish prayer. Take a moment to watch Bishop Callahan's Easter message. Divine Mercy Sunday devotions will take place on Sunday, April 28 from 12:00 to 3:15p. Exposition of the Blessed Sacrament will begin at Noon. Confessions will be heard throughout the afternoon along with hourly recitations of the Chaplet of Divine Mercy. A Divine Mercy information video will be shown at 12:30 and 1:30p. in the parish hall. Devotions will conclude with the Chaplet of Divine Mercy and Benediction at 3:00p. Come when you can, leave when you must. A change is coming! We will soon be switching our Online Giving platform to the We Share program operated by our bulletin publisher, Liturgical Publications, Inc.
Never miss your parish bulletin! In response to many requests, MMOC has adopted a policy (PDF) about using our new hall and education center for parish and other events. If you would like to hold an event at MMOC, please complete our request form and send it to the parish office. Please visit our Facebook page for photos and news of MMOC events. Please give the page a "like" and "follow" so you will be notified when there is news. When you or someone you love is in the hospital, we'd like to visit you, pray with you, and bring you the sacraments. However, due to ever tighter regulations at our area hospitals, they will no longer inform us when one of our parish family is in the hospital. Please have someone call us at 788-5483, ext. 2. Thank you. Video recordings of homilies at MMOC are now available; click "Homilies" near the top of this page. You can also get the videos on your phone via our app. The videos are closed-captioned (CC) for our sisters and brothers in Christ who have a hearing impairment. The Diocese of La Crosse, through its policies and procedures, seeks to provide a prompt, appropriate and compassionate response to reporters of sexual abuse of a child by any diocesan agent (employee, volunteers, vendors, religious or clergy). Anyone wishing to make a report of an allegation of sexual abuse should send that report to the Most Reverend William Patrick Callahan, bishop of La Crosse, at the Diocese of La Crosse, P.O. Box 4004, La Crosse, WI 54602-4004. Alternatively, you can contact Mrs. Karen Becker, Victim Assistance Ministry, at 608-519- 8002. The reporting form is available through the Diocese of La Crosse Office of the Vicar for Clergy or on the diocesan website at diolc.org. Individuals are also encouraged to take their reports directly to civil authorities. Copies of the diocesan policy are available through your local parish and on the diocesan website. If you have any questions about the Diocese of La Crosse and the implementation of the Charter for the Protection of Children and Young People, please contact Monsignor David Kunz, Vicar for Clergy, Diocese of La Crosse, at 608-791-2679 or dkunz@diolc.org. Fri Apr 19: Good Friday. Service at 1:00p. The parish office is closed. Sat Apr 20: Easter Vigil Mass 8:30p. Sun Apr 21: Easter Day Mass at 8:00 and 10:00a. Mon Apr 22: The parish office is closed. Fri-Sat Apr 26-27: Spring rummage sale. $3/bag Friday 11a-5p; $6/bag Saturday 8-11a. ● Marriage preparation retreat. Contact Maggie at Blessed Sacrament Parish, 608-782-2953. Sun Apr 28: Divine Mercy devotions 12:00 noon to 3:15p. Sun-Mon Apr 28-29: Baptismal prep classes for new or expecting parents. 9:00a Sunday, 6:00p Monday. Sat May 4: Seminarian Daniel Williams is one of 4 people ordained a Deacon at the Cathedral 10:00a. Thu May 9: Spring Chicken-Que! Save the date! Mon May 13: PCCW meeting 6:00p in the parish hall. Thu May 16: Silver Circle in the parish hall 11:00a. Vince Hatt's topic will be, "Understanding different religions so we can get along." If you need a ride call the office, 788-5483 ex. 2 or 5. Sat May 18: PCCW staffs the Brat Barn at Festival Foods in the Village. Mon May 20: MMOC tapes 2 televised Masses at the Diocesan Center, 5:00 to 6:45p. Sat-Sun May 25-26: Deacon Daniel Williams assists and preaches at all Masses. Mon-Sun June 3-9: MMOC delivers Mobile Meals. Contact Sue Moyle to volunteer (wsmoyle@gmail.com or 787-0076). Fri-Sat July 12-13: Marriage preparation retreat. Contact Maggie at Blessed Sacrament Parish, 608-782-2953. Sat Dec 14: Cookie Walk! Save the date! Mary, Mother of the Church is a Catholic parish family located in La Crosse, Wisconsin.